My Grandma Rose was a good Jewish cook. We had dinner with my grandparents most Friday nights, not because it was Shabbat - we weren't observant - but because my brother and I had piano lessons on Friday afternoons close to their house. Grandma Rose's repertoire wasn't huge, but what she made was very good. Chicken fricassee with little meatballs, my dad's favorite. Matzoh ball soup, which I later found out was Lipton's instant chicken noodle soup with matzoh balls from a mix. Stuffed cabbage, done sweet-and-sour Russian-style with golden raisins. Her famous rugelach once or twice a year. 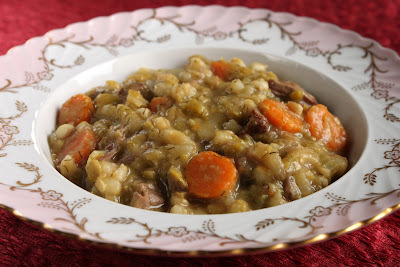 And, when we were really lucky, thick split pea soup with flanken beef ribs. When Grandma Rose made split pea soup, she made a lot - enough to send us home with a few zip-top bags for our freezer. This soup warmed my belly on many a cold New York day. If Grandma Rose had a recipe for this soup, I never saw it. I'm sharing with you my best guess. I know she used flanken (beef short ribs) and dried dill. I think I remember carrots and celery. My mother says Grandma used tiny pasta, but I like the chew of pearl barley. 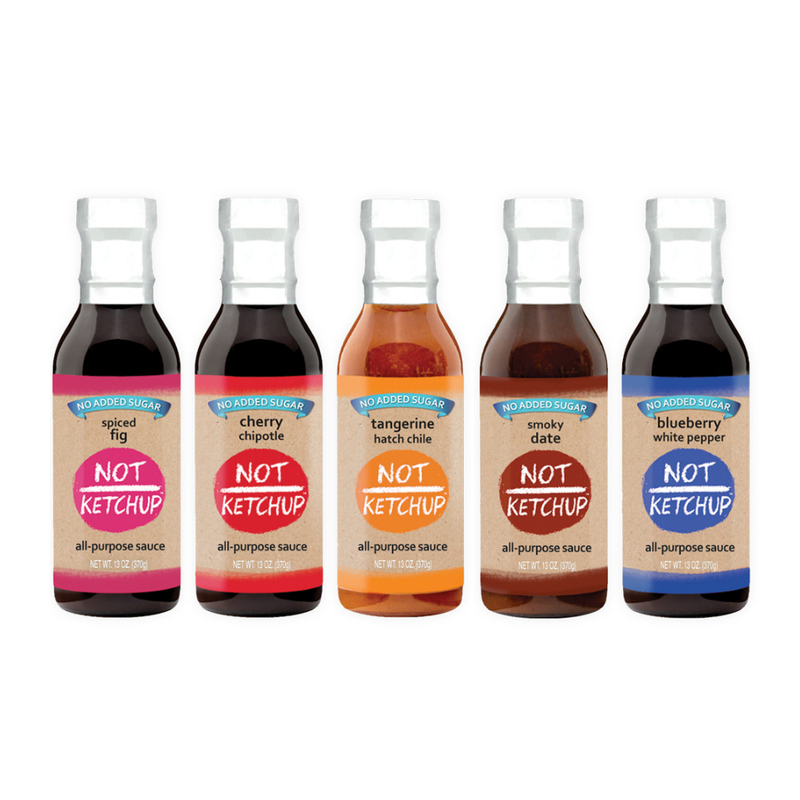 A note about ingredients: If you can't find flanken (pronounced FLAHN-ken), regular short ribs or boneless English short ribs will do. I used dried dill weed from Spice Islands, which I find particularly flavorful (the Spice Islands people sent me a sample specifically to use in this recipe). They harvest the dill as it's flowering and include the tiny yellow flowers with the leaves when they dry the dill, which they say accounts for its potency. By the way, the bowl in the photos is from a set of china that was handed down to me by my grandmother via my mother. No one else in the family wanted it because it can't go in the dishwasher. Lucky me! 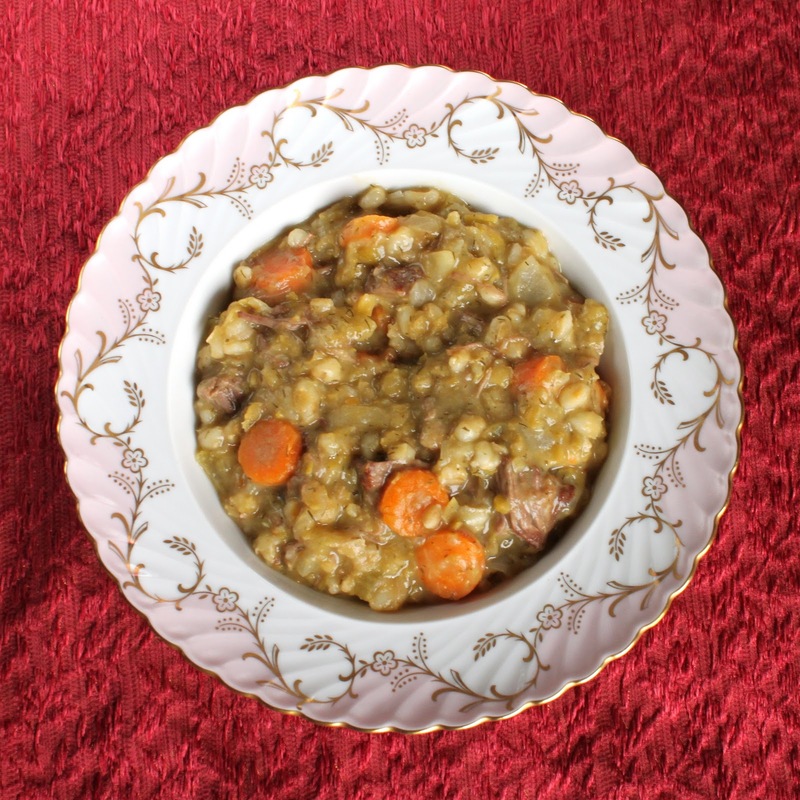 My grandmother's stick-to-your-ribs split pea soup - the perfect dish for a chilly day. It's much better after it sits for a day or two in the refrigerator, so plan ahead. Chop the onions, celery and carrots. Aim for 1/2-inch pieces, but don't get all OCD about it. You want them all roughly the same size, but a little bigger or smaller won't make a difference at all.Heat the oil in a large pot and brown the ribs on all sides. Remove the ribs to a plate, then add the chopped vegetables to the fat in the pot. Stir a minute or two until everything is coated in fat and starting to soften.Put the meat back in the pot, then add the split peas, pearl barley and dried dill. Add enough water to cover it all and bring the pot to a boil. Turn the heat down to low, cover the pot, and simmer the soup at least 2 hours, until it is thickened and the meat is tender.Shred the meat with two forks (or your fingers if you've let the soup cool for a while). The bones will have slipped out of the meat, so fish them out from the bottom of the pot with a spoon. Season with salt and pepper - you will need much more salt than seems reasonable, but keep salting until it tastes right to you.Serve hot for a hearty one-pot lunch or dinner. This looks delicious. :) Can't wait to try it out later this week! Mmmm...a split pea soup that resembles a hearty beef-vegetable stew with a lot of peas. A great improvement over a sea of only peas, sometimes flavored by a leftover ham bone, but always resembling a scoop from a swamp. Looks like the kind of meal that would warm you up and make you feel so good. Erika, you are so lucky to have your grandmother's dishes and how marvelous that you were able to recreate her recipe! I'm definitely going to try this when it cools down a bit here in Florida! I think KC meant the actual bowl! I have my paternal grandmother's silver, and remember so well where she used to keep it in her home, in its wooden box. But I too have no recipes. She used to make beef roasts in her pressure cooker... which I'm not eager to try. She made delicious twice-baked potatoes. I make them now too, but I have no idea if I'm doing things the same way that she did. 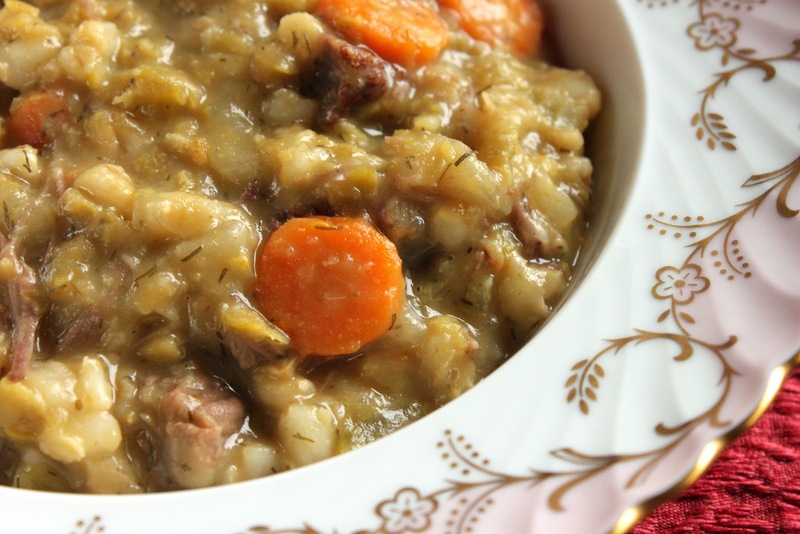 Mmmmm... this recipe could restore my faith in split pea soup! And lucky you, indeed. The china is gorgeous. Made this last night. It was delicious. Thank you for sharing your grandmother's recipe. @Anon I'm so glad you enjoyed it! My grandmother makes this too - I don't like stew because of the gravy, but this is essentially stew with "split pea gravy"... love it! Try fresh dill, they sell it the refrigerated produce section, also fresh parsley too. My family adds a box of elbow macaroni instead of the barley, but I love barley, so I'll be trying that next time! If you do use macaroni wait until 30 minutes before serving to add it. @Anonymous thanks for the macaroni tip! This recipe was a staple in my Mom-Mom's house in the winter, but marrow bones were used to flavor the soup as well. This soup is so good it will be like your grandmother is hugging you from the inside! @taoistpunk "like your grandmother is hugging you from the inside" - YES! This tasted so amazingly delicious-- it wasn't as thick as the photo showed, more like a soup, however. Do you think it is because I served it right from the pot same day? Thanks for advice. @NewNewYorkCook could be - the pearl barley and the peas both absorb liquid as they sit, so it does get thicker if you serve it overnight. But it's easy to thicken just by simmering it uncovered a little while longer and letting the extra liquid evaporate off. I'm so glad you liked it! I made this for dinner tonight. Substituted fresh dill for dried, and added some dried porcini mushrooms, together with the water I reconstituted them in, as well as about three cups of chicken stock instead of some of the water. It was delicious!